The tram works in Edinburgh may have contributed to a 10% slump in rents for retail outlets in the city's main shopping street. A survey of shopping streets worldwide said rents on Buchanan Street in Glasgow fell 3% in a year to £260 per square foot. 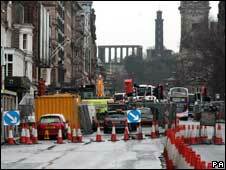 But Edinburgh's Princes Street saw a steeper decline, with rents falling by 10.6% to £210 per square foot. New York's Fifth Avenue had the most expensive retail address. The survey, by real estate firm Cushman and Wakefield, found Princes Street had been severely disrupted by the tram works, as traders struggled in the recession. Stuart Moncur, of the firm, said: "Princes Street in Edinburgh continues to suffer from the tram-line works, which are making it difficult for people to move around the street and this is having a negative impact on the performance of many retailers. "The building work is unfortunately giving a poor impression to potential tenants and many retailers are stating that they would rather wait and see how the city centre will function once the tram works are complete. "Even those visiting the city centre who are interested now are reluctant to make any kind of long-term commitment." Council leaders will decide next week if public transport should return to the World Heritage city to help Christmas trading. A report prepared for the council's policy and strategy committee has recommended that buses be allowed to return from 28 November. Mr Moncur said on Glasgow's Buchanan Street, rents fell less than anywhere else in the UK outside London. Buchanan Street is listed 10th most expensive in the UK, behind streets in London, Birmingham, Newcastle, Manchester, Leeds and Cardiff. According to the Cushman and Wakefield's survey, the global top five - ahead of London at number six - are New York, Hong Kong, Paris, Milan and Tokyo.